Welcome to our site. Central Park Nature is devoted to the natural history of Central Park. 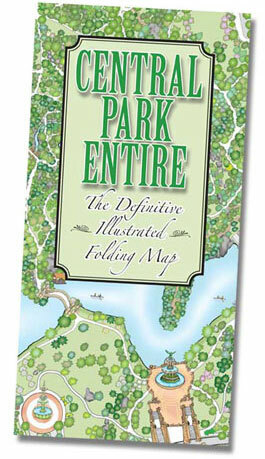 Our first project is a profusely illustrated comprehensive tree and trail map of Central Park. A stunning work of art—over two years in the making, it is now available as a beautiful poster map or as a folding map. In coming months we plan to introduce other unique products and features to this site that highlight and explore Central Park, the amazing wild green heart of New York City. We hope that you enjoy our site and will visit it often to learn more about the Park and its natural wonders. locates thousands of different trees, showing precisely where each one grows in the Park, with a special icon denoting its species. There are over 19,600 trees on the map! identifies every major tree species in the Park using over 170 different species icons provided on a separate Tree Legend and included with each poster. includes artwork depicting all of the Park’s architectural features—every building, bridge, archway, monument and statue. shows all paved paths and woodland trails, including obscure footpaths not shown on any other map of Central Park. accurately renders every lake, pond, and waterway including the most recent shoreline alterations. highlights all of the major rock formations and identifies them by name along with other geologic features. Illustrates all of the Park’s recreational areas including all playgrounds and ball fields; plus tennis, basketball, volleyball, and handball courts as well.